As we all know, anime is the fastest and most efficient way to enrich your otherwise bland afternoons. Whether it be for laughs, fights or reflection, those of you who don’t watch enough anime are missing out on something truly essential to living. Here are some musings about a few that I have watched recently in March 2011. 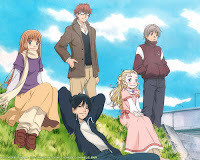 Honey and Clover is a rare blend of wisdom and the pure soul of living, wrapped in a unique (and somewhat terrifying) first opening sequence consisting of spinning food. 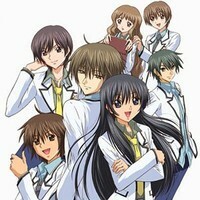 I have not seen any other anime series like this one. The story itself simply follows the ordinary lives of five college students for a few years. Looking back on it, not much really changes in their lives throughout the series, but yet somehow it compels you to keep on watching. The characters are developed extensively, their thoughts and feelings always being followed and seamlessly joined to each other. However, Honey and Clover ends a bit in the middle of nowhere, which was the most maddening part of it other than the food coming to life in the opening theme. Takemoto – The main point-of-view character. He is a first year arts/architecture student at the beginning of the series, and immediately falls in love with Hagu as soon as she is introduced. Unfortunately for him, Hagu later starts to like Morita and Takemoto ends up going on a very long bike ride across Japan in an attempt at self discovery. Hagumi (Hagu) – A very talented first year art student. She looks much younger than her age and is often mistaken for a small child. 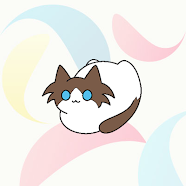 Hagu can be stressed to the point of physical illness from interacting with people, and many students think she is strange. Morita – A sixth year art student who continues to oversleep and fail classes. He is apparently a genius who disappears due to “shady” work for several days at a time. Morita has a great love for money and will do anything to gain more. His behaviour is incredibly bizarre and erratic. To this day I still don’t understand why he would chase Hagu around, dress her in silly outfits, kiss her, scream, wrap her head up in a scarf, and then flee in the opposite direction. Morita is also responsible for creating a game of Twister from Hell. Mayama – A fourth year arts/architecture student. 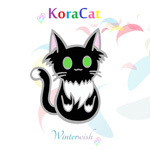 Seems to be the most normal and dependable one of the main characters. Mayama is in love with an older woman named Rika, whose body is scarred due to a car accident which killed her husband. Unable to forget her husband, Rika rejects Mayama but he is unable to forget her. Yamada – A third year arts/pottery student. She is in love with Mayama despite many other suitors being interested in her. 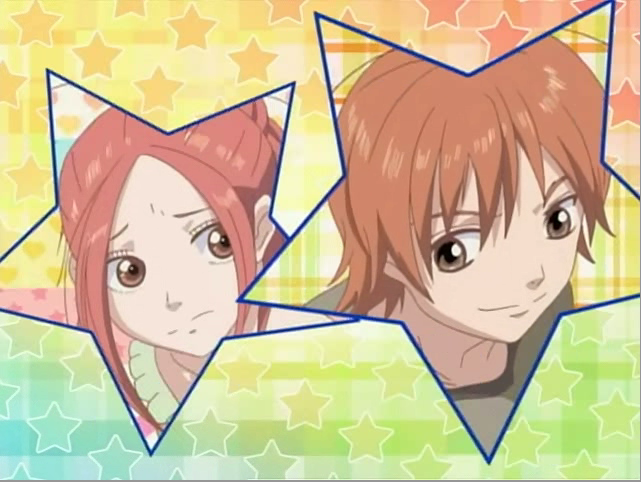 Due to his love for Rika, Mayama repeatedly encourages Yamada to love someone else. This situation often makes her upset and jealous. 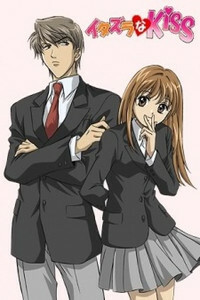 She ends up being involved with Mayama’s former boss, an older man called Nomiya. What will I gain from this? You will be neurotically suspicious of every prawn tail you see for the rest of your life. 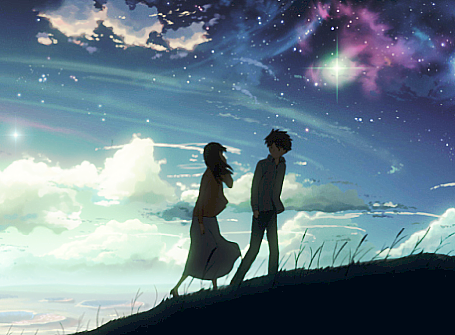 A movie vaguely reminiscent of Honey and Clover, except extremely drawn out. The title refers to the falling speed of sakura petals, starting to fall together and then drifting apart. Five Centimetres Per Second tells the story of two children who attempt to keep their love alive throughout the years. It mostly follows the emotional development of the main male character. You will realize how treasured, long distance relationships from childhood rarely work out. A short series about the interactions between an office worker and a young voice actress. Shows the ups and downs of their work and how it reflects on their behaviour and thoughts. Basically they both deny they are lovers right down to the very last few moments. All about one girl’s dream to enter the world of “showbiz” in order to get revenge on her superstar ex-boyfriend. Although the summary may sound bad, the actual episodes are all worth watching. 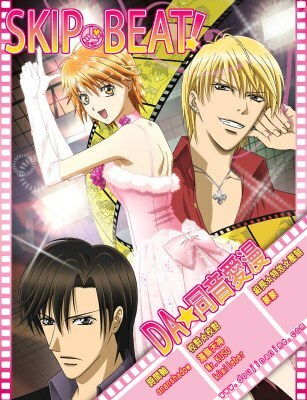 Skip Beat is a great blend of comedy and acting success, even if there is little actual character development. Clearly the two main male characters were designed to appeal to girls watching this series, even if not much is really known about them. The most irritating thing about Skip Beat is that it ends at the most inappropriate point in the story, making you feel like they shouldn’t have started to animate the series in the first place. You too can aggravate your ex-boyfriend by surpassing him in his industry, all while attracting his arch nemesis at the same time. For a series largely based on attractive main characters wielding machine guns, there is surprisingly a lot of character development involved. 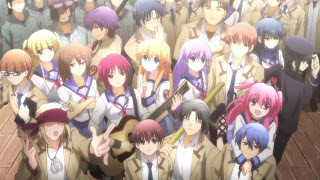 Angel Beats is set in a world which exists between the afterlife and death, where the dead souls who lived an unfulfilling life have the chance to find peace. Mixed with great humour and interesting characters, my only complaint is that there was not enough time for all of the character past histories to be explored. 1. My life has no meaning = I must become an organ donor. 2. You will realise the splendour of phrases uttered in broken English. 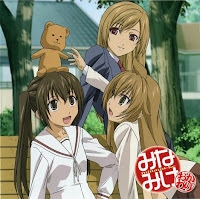 The first season of a series which follows the everyday lives of three sisters. All three girls have different personalities, leading to many unusual situations. The quality is maintained throughout all the episodes, although the next two seasons have different art styles and are directed by varying people. 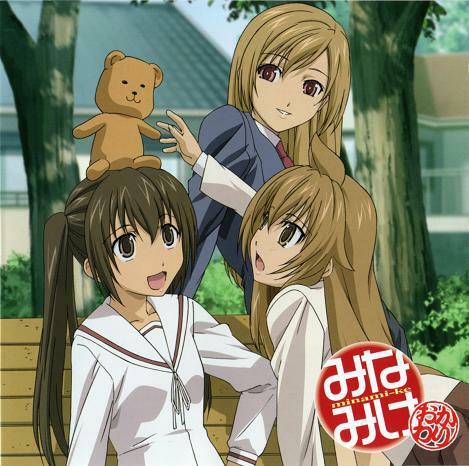 The main attraction of this series lies in the interaction between the middle sister (Kana) and pretty much any other character, particularly Fujioka. You too will feel their pain after witnessing this, and yet still find it oddly comical at the same time. I found all three seasons of this series to be enjoyable, with the first and third being a little ahead of the second. Every institution has a legendary Badass, so make it your duty to find out who it is. A story about a ditzy girl who falls in love with a perfect-handsome-genius type guy at high school. The series actually follows their lives together all the way to the birth of their first child, where we learn that everything turns out okay for everyone, which is nice. However, the turn of events from rejection to marriage is hard to buy, as is the interaction between the two main characters. Particularly the main guy, who acts incredibly weird towards people at some points. Oh well, this is a shojo and I think it’s meant to give all girls some kind of hope. Either way, it’s still fun to watch. Comes with a good opening theme song to boot. House destroyed + pretty face + perpetual persistence = Perfect husband GET! Two young, innocent schoolgirls messing with magic and liking boys. Exactly how your real days at school should have been like. Drawn nicely with lots of pretty colours, and features a conclusive ending. Ultra Maniac reminds me of Cardcaptors, only with more substance. Clearly targeted at a younger audience, so don’t expect anything too deep though. People who you like already like you back, they just haven’t done anything about it yet. 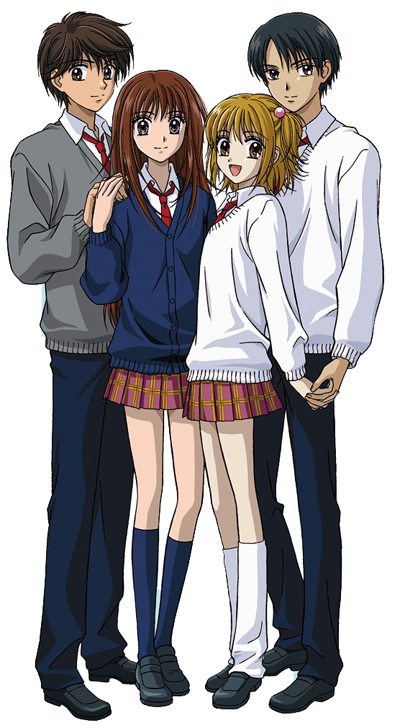 A high school tale focusing on two main characters, a guy named Ryuji and a girl called Taiga. These two eventually form an alliance to help each other get closer to the people they like, with Ryuji being interested in Taiga’s closest friend, Minori. In contrast, Taiga likes Ryuji’s close friend, Yusaku. After numerous failed plans and a random fan service episode involving Taiga and a model named Ami, Ryuji and Taiga end up becoming closer to each other instead. It is later revealed that Yusaku was rejected by Taiga before, and has since been in love with the school council president, which kind of means Taiga is too late for regrets. Minori apparently has always liked Ryuji back, but after observing the increasing closeness between him and Taiga, she rejects Ryuji for fear of losing Taiga’s friendship. And so, in the last few episodes everyone is screaming, crying and running off due to all the drama. Ryuji and Taiga end up running off together to be married for some odd reason. Amazingly nobody goes for Ami, who is clearly the best looking ‘main’ character. 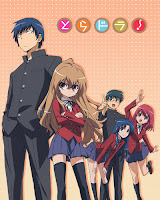 While Toradora is still a good series, I think His and Her Circumstances far surpasses it. The unfolding of events towards the end of Toradora seem quite awkward and the characters’ actions come across as unnatural somehow. I didn’t find any of the characters very likeable either. Don’t mix best friends and love interests, unless you like mess. At the pinnacle of the comedy/romance genre stands Lovely Complex, a beautifully crafted story about the love between a tall girl named Risa and a short guy named Ootani. Their interactions and the feelings depicted are eerily believable, while their voices and the artwork are well presented. Truly this is an awesome series, particularly if you like to laugh. If I told you to think of this pickled radish as crab from today on, could you just say ‘okay sure’? Finally, a series made that has a good story as well as completely attractive characters. Special A is a little reminiscent of Ouran High’s Host Club, only with a few actual girls in it. A funny shojo made with great humour and visuals, so yet another piece of comedy/romance that no girl should miss. Ironically, the main male character is named Kei, and he also resembles the Kei Hazuki from the Tokimeki Memorial Girls’ Side NDS game. Connection? 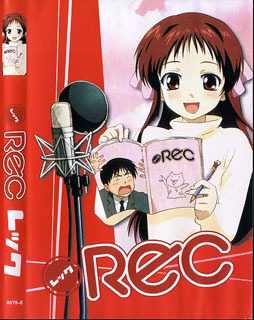 In any case, I earnestly wish they made more anime like this one. Delicious eye candy, hilarity and pleasant music. All in one.